Schoenhut toy pianos look like their larger counterparts. For generations children have loved picking out tunes on an antique Schoenhut toy piano. Considered by many to be the ultimate toy piano, a Schoenhut is a great find for any antique buff. Albert Schoenhut was a German immigrant who had a family tradition of toy making. He began making toy pianos in his home at an early age and perfected them over the years. People that bought Schoenhut pianos were amazed that they stayed in tune for years because of the precise way that Schoenhut made them. John Dahl, a buyer for John Wanamaker, heard of the amazing work that Schoenhut did and brought him to Philadelphia. He gave him the job of repairing the imported German toy pianos which had been broken during shipping. Albert Schoenhut was 17. The Schoenhut Piano Company was begun in Philadelphia, Pennsylvania in 1872. Soon more instruments and other toys were added and by 1900 Schoenhut Piano Company was the largest manufacturer of toys in the United States. Because of Albert Schoenhut's unique way of creating the toy pianos (which Schoenhut still uses in some form) the Schoenhut toy piano has become known as an innovative design which consistently has a unique, beautiful sound. 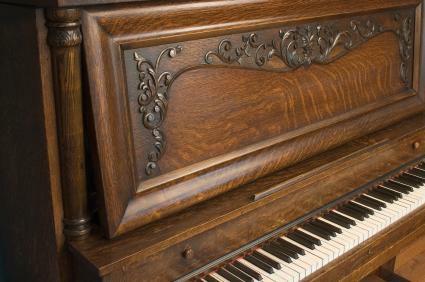 The pianos are not mere toys, but are considered to be authentic musical instruments. Each key is chromatically tuned and able to create true notes. The keys are correctly spaced on the keyboard so that proper finger placement is learned even in play. The toy pianos have a varying number of octaves depending on the model. While a full size piano has seven and a half octaves, the Schoenhut will have from one and a half to three. You should clean your antique Schoenhut toy piano carefully. Never use spray polish. Use a beeswax based polish instead. Keep away from sunlight. The sun will not only fade the finish, it will dry the wood. Check monthly for loose joints and other problems that may need repair. Minor repairs can turn into major problems if they are left undone. If you do have to have repairs done always find a reputable restoration specialist. There are some repairs that could potentially lower the value of the piano. Refinishing is usually not recommended as most antique collectors value the natural patina and wear of the piece. Displaying your antique finds is part of the fun of collecting them and an antique toy piano is no different. Set your piano up in a safe place and arrange other toys around it. Dolls and teddy bears are a natural match for a toy piano, but other toys will work as well. If it is a smaller piano place on top of a chest or other flat surface. Place vintage sheet music around it. Place several pianos together in a group. Keep the antique piano away from sunny windows and out of high traffic areas. You can also let your local antiques dealer know that you are looking for a Schoenhut antique toy piano. Many times they will be able to locate what you are looking for. Always deal with someone you trust to ensure you are not buying a reproduction. With care and gentle handling your Schoenhut piano can bring joy to many more generations of music lovers, young and old.